Taking that first step towards a new enterprise resource planning (ERP) system can seem daunting. But with proper planning and preparation, you and your team can ensure your ERP implementation project progresses smoothly and within schedule. 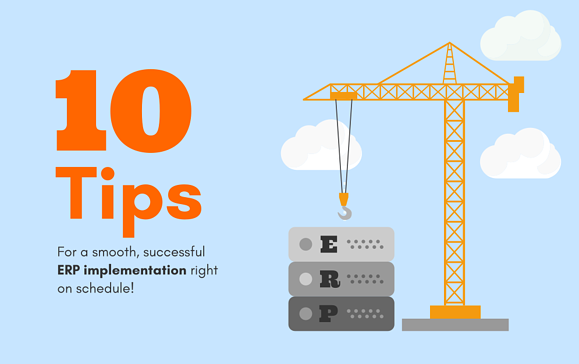 Read on for 10 tips for a smooth ERP implementation! With any major changes to your business or processes, you must identify your early adopters. Early adopters are the members of your team who are pro-change and receptive to the new system. When it comes to ERP, it will likely be those who have been part of a transition with previous employers or who have utilised an industry ERP before. It is helpful if your early adopters are part of the executive, management, or HR teams—if not, they need at least to be able to speak about the benefits of a new ERP system at a high level. This will help to get executives and team members on board. Goal setting is an essential part of the ERP planning process. Begin with your most common employee frustrations and process bottlenecks, seeing how systems integration can be utilised as a resolution. Then, think bigger. Set measurable goals and objectives that can be achieved once you standardise, streamline, and integrate. Consider positive impacts across every department, from planning to purchasing, sales, marketing, distribution, finance, HR, and more. It is helpful to have at least one member from each department as part of this team, as they can weigh in on any automation or cross-functionality they, and other members of their department, would like to see achieved. As you identify new features and functions you need your new system to achieve, map out the desired workflow. For example, when a sale is made by a member of the sales team, the information is automatically pushed to the warehouse department for order fulfilment—then on to the packing, shipping, and delivery team. Consider all major interactions and how they can be streamlined. This may include customisations that your current software falls short on, such as an interaction you wished it could achieve but has been unable to. Again, get all business departments involved and brainstorming the benefits of system integration. An ERP software implementation will require some manual data migration. However, it’s important to consider what this all needs to come with.This step will be most relevant to companies who have been in business 5 years or more. You will need to determine how much historic data (typically in terms of years) needs to be migrated, how much needs to be migrated by the time your ERP goes live, and which end-users have access to varying categories of data. Both electronics and the workforce are increasingly mobile, and the rise in BYOD (Bring Your Own Device (to work)) continues to grow. This makes the present an excellent time to rethink your mobile policies, including remote access for your employees. It is also time to consider if and how mobile devices can be utilised to improve productivity. Can handheld devices create internal and external efficiencies? For example, allowing a team member to complete and automating a business process while out of the office or not their desk. If so, consider how this might impact your planning for your ERP implementation. Before you get too far down the process, you will want to reach out and chat with one of your hired ERP implementer's team members. A good ERP software vendor will walk you through the process, discuss budgets and timelines, and help answer some of the early questions you may have before you get too far ahead. They will also discuss any industry-specific needs you may have. You already have your early adopters, and part of their role is to get the rest of the team pumped up about the impending positive changes. Find ways to squeeze in statements such as, “with our new ERP we can skip XYZ for this process”. The more ways in which you highlight the benefits, the more excited for (and less resistant) your team will be to the change. You may not be able to win them all over immediately, but you can set the foundation to do so. Learning how to use your new ERP solution will require training, but rest assured that an intuitive system is a primary goal. If you have a training department and/or a change management expert, be sure to keep them in the loop. Your main goal is to identify the best strategies for minimizing the disruption. One of the greatest challenges will be how to train the team once your system goes live – or even before it actually does. One department at a time? In a series of videos? One-on-one? The test phase is one of the most important steps in ERP system implementation. Schedule a beta test with a handful of members from each department, or with employees involved in your most critical business processes. Don’t just test for the current process, but any new automated functions and related customisations. Don’t rush the test phase, particularly if there are a lot of new changes on the way. You and your team have put in a lot of hard work. The fruits of your labour will lead to everything from internal efficiencies, increased throughput, advanced data and analytics, seamless automation, improved customer satisfaction, happier customers, and the potential for immeasurable innovation. As you tick off each item on your checklist and each phase of the project is completed, take a moment to celebrate that you are one step closer—or have reached the finish line! While we take care of all things technical, we need you to plan ahead to ensure that we understand what “finished” looks like. With proper ERP planning, implementation won’t be half the undertaking you might imagine it to be! We hope you found this post useful! Feel free to contact us whenever you're ready to take the next step in your ERP implementation. Not sure if an ERP system is for you? Download our free ebook below to find out if your accounting system is hurting business, and/or subscribe to our blog on the top right to learn more about ERP! Grace is the Marketing Executive at AFON, where she focuses on inbound marketing and the execution of campaigns.